Minded Security's Magik Quadrant for Mobile Code Protection shows our evaluation of the top vendors in this market, based on our research and experience, updated to 2018. Why care about Code Protection? The main reason lies in the fact that Mobile Applications runs within an environment that is not under the control of the organization producing the code. Since 2016, the OWASP Mobile Top 10 has included two new categories related to that, that is M8-Code Tampering and M9-Reverse Engineering. Code Tampering is the process of changing a mobile app (either the compiled app or the running process) or its environment to affect its behavior. Tools and frameworks like Frida, Substrate, Cycript, Xposed and FLEX could give an attacker direct access to process memory and important structures such as live objects instantiated by the app. They come with many utility functions that are useful for resolving loaded libraries, hooking methods and native functions, and more. This can provide the attacker a direct method of subverting the intended use of the software for personal or monetary gain. Code Tampering could be prevented by detecting at runtime that code has been added or changed since compile time. Reverse engineering a mobile app is the process of analyzing the compiled app to extract information about its source code. An app is said to be susceptible to reverse engineering if an attacker can derive a reasonably accurate reconstruction of the source code from the binary. Also to that, it is important to implement anti-debugging techniques and verify if the application is running on a rooted/jailbroken device. Some commercial tools provides code protection without requiring developers to implement their own custom controls. The remaining of this blog post is going into details about the tools available in the market in 2018. 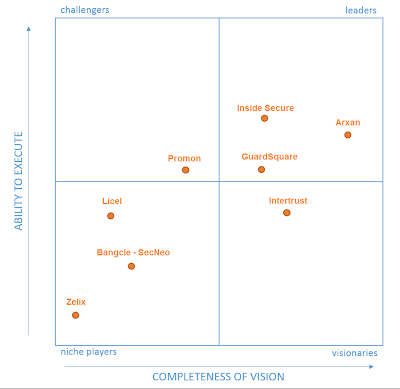 The Magik Quadrant study performed on Code Protection solutions takes into account multiple criteria based on Ability to Execute and Completeness of Vision. Before proceeding, it is worth noting that focusing on the leaders' quadrant isn't always the best choice. There are good reasons to consider market challengers. Moreover a niche player may support a specific needs better than a market leader. Leaders offer products and services that best cover current scenarios and are well positioned for the future. They provide solutions that are cross-platform, so with one vendor is possible to protect many platforms. Their complex solutions provide protection (through obfuscation, encryption, call hiding etc. ), detection and reaction (in case an attack is detected). 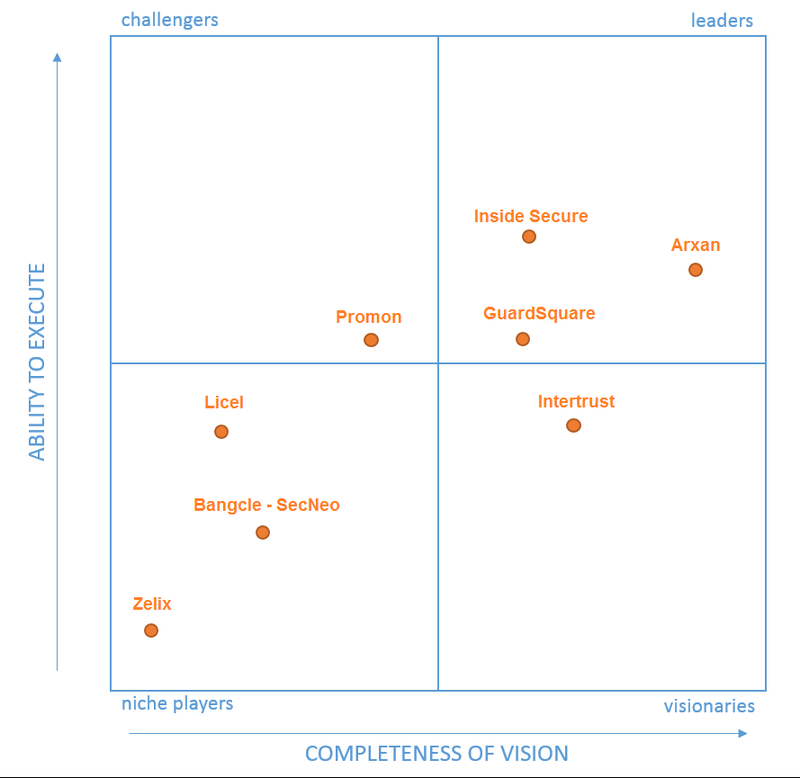 In general, in any Magik Quadrant the Visionaries are the innovators. They understand well where the market is going and therefore they can provide innovative techniques to protect the applications in a cross-platform environment. Niche Players, in our research, are vendors that do not offer, at the moment, a cross-platform solution but they are focused on a small segment. Since they are offering platform-specific solutions, in some case they are able to provide innovative and specific solutions for that specific target. This analysis pertains to Arxan's Application Protection. Arxan is one of the most trusted names in application security. They provide protection against a widest range of static and dynamic attacks. The protection, provided by Application Protection, is implemented on different layers giving the chance to select the desired level of security. This analysis pertains to Inside Secure Code Protection and WhiteBox. Inside Secure is one of the leaders in the application security market. They provide a cross-platform solution based on different "modules". This analysis pertains to Intertrust whiteCryption. Intertrust is relatively new on this market but offers an innovative product that is designed to protect applications at all levels. This analysis pertains to GuardSquare DexGuard and iXGuard. GuardSquare is very famous since they develop and support ProGuard, that is the successful open source obfuscator for the Java language used for Android application. DexGuard is derived from that, while offering more advanced and sophisticated protections. They have a great experience in Java and Android platform and recently they started offering also iOS support through the iXGuard software. This analysis pertains to Licel's DexProtector. Licel is a new competitor in code protection. Its product, DexProtector, is designed for comprehensive protection of Android applications mainly against reverse engineering, clone protection and tampering. This analysis pertains to Bangcle AppShield, AppSCO and WhiteCrypto. This analysis pertains to Zelix KlassMaster. Zelix has a long story and experience in code obfuscation. Since its release in 1997, the Zelix KlassMaster Java code obfuscator has been continually developed to keep it at the forefront of obfuscation technology. This solution provides a Java code obfuscator but it does not implement other protections such as those against code tampering attempts. This analysis pertains to Promon SHIELD. Promon is a Norwegian firm specializing in app hardening focusing largely on Runtime Application Self-Protection (RASP). Important note: it is worth noting that all these security controls do not give a guarantee that mobile applications are going to be 100% secure, but they can provide additional protection and make very hard for an attacker to carry on reverse engineering, tampering and runtime attacks.